Size of this preview: 800 × 475 pixels. Other resolutions: 320 × 190 pixels | 640 × 380 pixels | 1,024 × 608 pixels | 1,280 × 760 pixels | 2,750 × 1,633 pixels. This image was selected as picture of the day on the English Wikipedia for June 7, 2013. 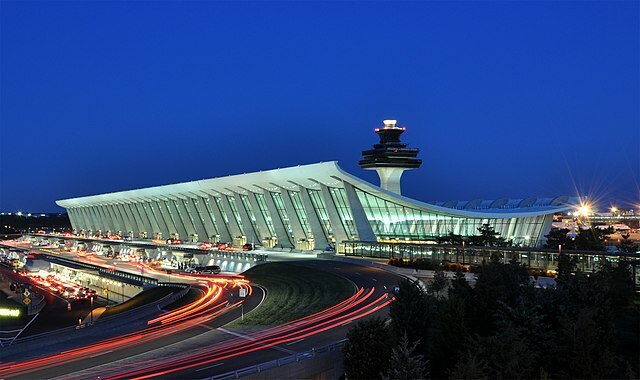 English: Main Terminal of Washington Dulles International Airport at dusk in Virginia, USA. Français : Terminal principal de l' aéroport international de Washington-Dulles (Virginie, Etats-Unis), au crépuscule. Español: Terminal principal del aeropuerto internacional de Washington-Dulles en Virginia, Estados Unidos, en crepúsculo. When using this image under the Creative Commons Share-Alike License please attribute this image to the author, Joe Ravi, and include the acronym of the license CC-BY-SA 3.0 in a prominent location near the image. This image and its creator were featured on the Wikimedia Foundation blog on 13 June 2012. This is a featured picture on the Persian language Wikipedia ( نگاره‌های برگزیده) and is considered one of the finest images. Dansk: Hovedterminalen ved Washington Dulles International Airport ved aftentide, Virginia, USA. Deutsch: Das des Flughafen Washington-Dulles-International in Virgina. Français: Aérogare principale de l'aéroport international de Washington Dulles en Virginie au crépuscule. Italiano: Terminal principale dell' Aeroporto Internazionale di Washington-Dulles al crepuscolo, Virginia, Stati Uniti. Nederlands: Washington Dulles International Airport tijdens de schemering in de Amerikaanse staat Virginia. De luchthaven ligt op 42 kilometer ten westen van de binnenstad van Washington D.C..
Македонски: Главниот терминал на вашингтонскиот аеродром „Далес“ приквечер. ქართული: ვაშინგტონის დალესის საერთაშორისო აეროპორტის მთავარი ტერმინალი, ვირჯინია, აშშ. 한국어: 워싱턴 덜레스 국제공항의 메인터미널. 미국 버지니아 주.